There are 10 things great about all countries on the planet. Labels of Third World Underdeveloped Developing are labels of failure to avoid when astute. "We need to know our 10 labels of success." We humans cannot escape a generalized label; why? Because the label is legitimate, generalizations are generally correct. Our only defense is to ignore them when someone is banging us on the head with generalizations. . Or, enter into the game of one-up-man-ship, lower our level of manners, and tell you the specific 10 skills where I am an extreme success the master in comparison to you. Do you know 10 things you are great at? If not, then you are defenseless, and need to work on your social status quo skills? I am 100 percent sure you are good at 10 things, all human are, we all are good at something. Learn them, but not to brag, but sometimes braggarts need pushed off their pedestals, knocked down a notch or two. Africa is defenseless, almost nobody come to Africa, to Togo, to Ghana, to Ivory Coast to say, you are best this, be proud, and build on your success. I have come to Togo many times, one of my favorite countries on the planet, and yes, I do need to ignore a few negative generalizations. 1. Togo has great wood carvers, some really special artists. 2. Lome Togo is one of the biggest party capitals, the Paris of Africa. The expats hanging around here can be most globally aware, more intellectually aware than any other expat on the planet. 3. Togo has a government that does not get involved. The government of Togo makes so much money off their port, that the police, military do not need to fine you, tax you, or even get bribes from you, they just are not bothering their people, the government does what the government does, almost ignoring the populace. This is 10 times better than having a policeman on every corner in Dominican Republic stopping cars for money. 4. 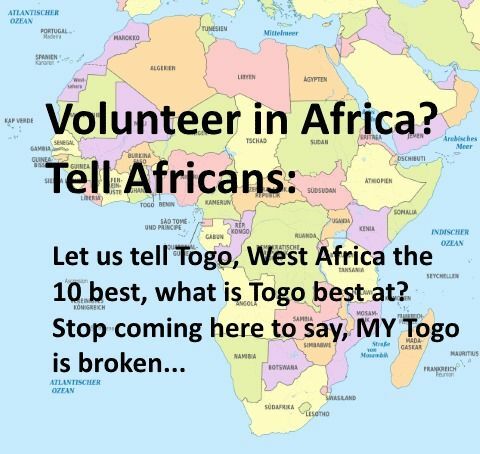 Togo is one of the least politically correct cultures on the planet, they are not going to tell you what is wrong with you, and they are going to tell you what is right! 5. Some of the best beef brochettes on the planet. 6. Lome, Togo is a beach city, the roads are sand, one of the few country capitals that is really a beach. 7. 27 Kilometers wide, one of the best countries to walk across in a day. 8. Center of planet for Voodoo. 9. One of the least petty theft crime countries on the planet, to get robbed in Togo takes serious effort. 10. Country with 3 climates, ocean, savanna, and desert. We can work on this list, and make it grow. Yet, it is acceptable to talk negatively about Africa, most only know South Africa, one of the most dangerous countries on the planet, high in AIDS, and want to generalize this to all of Africa, there are 53 countries in Africa, and one bad apple sure can spoiled the whole bag. Nigeria is not helping, and the inner city of the USA is not a good role model. American in some weird logic, want to think Africa is an a huge big, inner-city ghetto from the good ole US of A. It is almost impossible to buy a gun here in Togo, they are too poor to drink.. LOL - Drugs, that is something Sweden excels in, not Togo, West Africa. Yet we rich countries, less than 25 out of 253 are more than willing to label whole continents, countries as failures. We call them underdeveloped, when really we are the odd ones, we are the over-developed countries, we are not normal, we are industrialized, the biggest polluters on the planet. This is a generalization, a negative one, which is correct. Oops, your country does not compete, it is the Third World, and how to escape a label like that is almost impossible. Why? It is not possible to break a generalization, because generally, generalizations are correct, that is just common sense, what is general, is generally correct. I lived in Africa a few years of my life. We are all generally part of a label we cannot escape, better to embrace the label, learn to love the label, then fight it and give power to the label makers. I am the salt of the earth, I am Indiana, human flesh that can be respected. Personally, intellectually, for critical reasoning reason, “I love labels,” they give me ground zero from whereby I can start getting specific, but without getting specific, they are just class status labels, demanding the group stay in their social class, never change. Using generalizations is a problem for me, I need to stop this habit of saying them, but I am not going to stop thinking them. We never do, we cannot stop that inner voice, at least I cannot, many of you are born liars, you lie to yourself so much, you forgot how to tell the truth. The PC crowd, says, do not say what you think, we want to hear lies. When we tell others why we, me, us are specifically different, then we can celebrate. Whoopee I am awesome. I, we need to be specific in our praise. How doe the first world react when we talk about Africa? When we, who knows Africa, when we talk about our travels to Africa, the body language reactions, the tone of voice reactions, the direct responses are painful from our friends, family, and people what we thought were open minded people. I can feel their brains slamming shut. Yes, these so-called First World countries people are clever; we have learned to talk in a way to hide our inner thoughts, our gut level beliefs about Africa. We keep is PC, politically correct, but our eyes, and voice tell the lies. I cannot hide this, “I ARE ONE,” I am from the haves, not the have nots. However, our body language, and tone of voice does not lie, our corporal language screams, we want to say, but stop ourselves, we “haves,” it is not nice to pick on poor people, we know we should keep our mouth shut, but everyone knows it is acceptable to talk in broad sweeping negative generalizations about Africa, 53 countries on the planet. Really, it is kind of trendy, as if we are working to fix the broken. Success can be measured, these big labels destroy cultures, they really cannot be measured, and they are silly. The HDI, human development index is a label of all the problems, and really fails to say, what is this specific country best at, there is nothing in balance, nothing fair about the HDI. The HDI also dooms countries, hard to escape a generalization, can you remember this? We must build on our success, exploit our successes. 100 percent correct, Indiana is a bunch of farmers, and me being from Orland, Indiana makes me part of an impossible to escape group, (label) I live with a bunch of farmers. Yet, the unspoken truth, and we do not say this, yet the truth is, if I wanted to brag, it would be better to brag that I am a New York City Lawyer, or maybe Stock Broker, those two label will get me the best table in the restaurant, completed with beautiful woman. We farmers from Indiana are also rans. We Indiana Hoosiers did not cause the latest economic crisis, we are not a bunch of thieving stock brokers, clever lawyers, in fact, the city I live in for 14 years, Fort Wayne, Indiana is called the “City of Churches,” Orland, Indiana where I grew up is as close to paradise culture on the planet I have ever meant, even when I include, they kicked Barry Friend out of town, for being sort of crazy. But what do I know, I only have visited 107 countries, I can compare Orland, Indiana to the planet, and it is a small town of winners, good people, people the USA can be proud of. Togo has great wood carvers. Lome Togo is one of the biggest party capitals, the Paris of Africa. Togo has a government that does not get involved. Togo is one of the least politically correct cultures on the planet, they are not going to tell you what is wrong with you, and they are going to tell you what is right! I can find the good in anyone, it is what my mother, and father wants me to do. There is no way Denmark, or Germany, or the USA can compete. With labor at 3-5 dollars per day, we can have our Togolese workers work one week on each piece of furniture, in comparison to the 15 minutes of an industrialized nation. In the end, the human capital labor force of Togo has the time to do it perfect, to grant the love needed to make it the best. Perfection requires time, with a lot of love inserted. Can they say anything good, or do they just want headline? Please note, I have never seen an Elephant in Togo. 2. You could find a wife in 10 days to marry. 3. One of the best places to learn how China, India, and Lebanon are investing in Africa, up close and personal. 4. One of the best place to make an opinion, are the American Peace Corps workers doing something or just partying? 5. Kpalime, Togo you can find 100 AID organizations within one block, so you can study NGO's, ONG's fast.